The meticulous research and archival work that went into the writing of the book makes it stand out among a rather fashionable array of works on the meaning of home, of exile, and of cosmopolitan identities. When Paul Celan was charged with plagiarism in 1960, the ensuing public debate in West Germany threw the poet into a major personal crisis even though most German critics immediately came to his defense. This crisis coincided with a transformative moment in the history of Holocaust remembrance, its first generational reimagining in the wake of a number of highly publicized criminal trials. Words from Abroad takes its lead from this disjunction between public ritual and private crisis to chart the emergence of a new literary diaspora, examining German Jewish writers who were dislocated in the course of World War II and began rewriting their own displacement more than a decade after the war. The idea of diaspora had ceased to be a constructive element of Jewish culture in Germany during the nineteenth-century process of emancipation and assimilation, though this book argues that it becomes crucial in articulating the possibility of German Jewish identity after the Holocaust. Along with the works of Paul Celan, Words from Abroad examines selected German Jewish writers such as Peter Weiss and Nelly Sachs. The study of these authors is framed by theoretical reflections on the play of distance and proximity in German Jewish intellectuals after the Holocaust, including Theodor W. Adorno, Jean Améry, and Günther Anders. 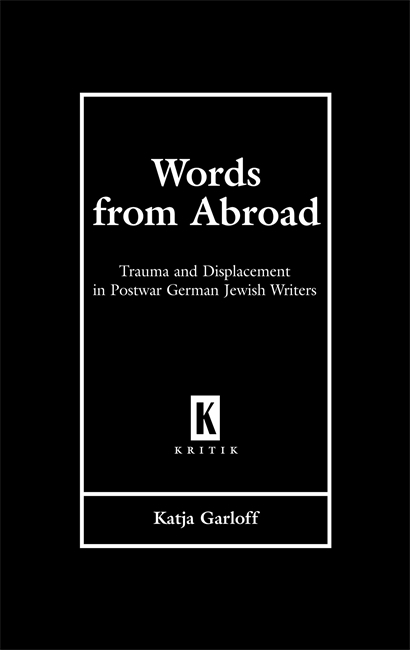 Drawing on postcolonial theory, diaspora studies, trauma theory, and psychoanalytical theory, author Katja Garloff offers an original and nuanced reading of the way in which these writers, in the wake of the Holocaust, experienced and variously created a vision of dispersion as both traumatic and productive. Words from Abroad is an important tool in investigating the works of these German Jewish writers and thinkers, but it is also a contribution to the interdisciplinary scholarship on trauma and displacement itself. Katja Garloff is associate professor of German and humanities at Reed College. Katja Garloff's book offers a rich and persuasive study of the works of German Jewish writers of the survivor generation in the context of diaspora theories, which have frequently ignored or elided a consideration of Jewish cultural paradigms. Garloff's book succeeds in linking the often strangely disengaged fields of German Jewish and diaspora studies, and forms a significant and highly engaging contribution to these evolving areas of research on the individual authors considered, as well as in future studies of the relationship between Jewish and diaspora studies." Words from Abroad presents a well-honed and documented, theoretically grounded study of how diasporic consciousness is represented in the writing of German Jewish writers, such as Peter Weiss, Nelly Sachs, Paul Celan, and T. W. Adorno. . . . The meticulous research and archival work that went into the writing of the book makes it stand out among a rather fashionable array of works on the meaning of home, of exile, and of cosmopolitan identities." Garloff's book is a timely and astute analysis of a group of highly acclaimed German-Jewish authors who were displaced by the Holocaust and who made a conscious decision to write in German after the War but did not - and perhaps could not - live in Germany. Garloff has written a compelling analysis of how a significant group of German-Jewish authors created a unique pace - out of destruction - from which to speak, that, in turn, gave rise to a cultural productivity that cannot in any way be denied." Words from Abroad offers a novel approach to exile literature in its combination of psychoanalytic theory, cultural studies, and exacting close readings. Although it runs the length of a standard monograph, it covers a broad terrain, not the least of which is the study of terrain itself in the postwar German-Jewish literature."